Brightex active lightning protection system is an unique active lightning protection system made in Canada, used to protect people, installations and investments against lightning strikes. Using active charge neutralization technologies to effectively detect and defuse lightning storms before they occur, Brightex’s CPLR . (Compound Plasma Lightning Rejection) units provide an additional layer of protection to shield your valuable assets, personnel, and equipment on the ground. Brightex’s advanced lightning rejection process begins once the Fore-Alarm unit (active lightning storm detector) detects the increased atmospheric electrical field strength of an approaching storm. 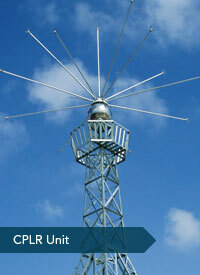 The CPLR is then signaled to create a high density plasma cloud consisting of negative and positive ions. This cloud effectively reduces the electrical charge of a storm and greatly reduces the possibility of lightning strikes. The advanced Brightex’s CPLR (Compound Plasma Lightning Rejection) system detects atmospheric electrical field intensities(Lightning Clouds) up to 20 kilometers away. Once a storm Lightning Cloud has been detected, then CPLR unit actively creates a high density plasma ions before the arrival and passage of a storm cloud through the protected area. This plasma, consisting of high density negative and positive ions, shields and protects surrounding buildings, infrastructures, equipments and most importantly people. National defence, utilities, power generation facilities, industrial plants, financial institutions, airports, communication facilities, oil and gas operations around the world are turning to Brightex for reliable lightning protection. We represent Brightex in Africa and help it valuable customers round the world with the equipment sales, installation, commissioning and technical support.